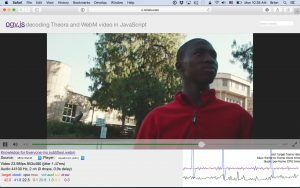 Seeking in WebM playback will finally be supported in ogv.js 1.1.2. Yay! Try it out! This took some fancy footwork, as the demuxer library I’m using (nestegg) only provides a synchronous i/o-using interface for seeking: on the first seek, it needed to be able to first do a seek to the location of the cues in the file (they’re usually at the end in WebM, not at the beginning! ), then read in the cue data, and then run a second seek to the start of a cluster. On examining the innards of the library I found that it’s fairly safe to ‘restart’ the operation directly after the seek attempts, which saved me the trouble of patching the library code; though I may come up with a patch to more cleanly & reliably do this. For the initial hack, I have my i/o callbacks detect that an attempt was made to seek outside the buffer range, and then when the nestegg library function fails out, the demuxer sees the seek attempt and passes it back to the caller (OGVPlayer) which is able to trigger a seek on the actual, asynchronous i/o layer. Once the new data starts arriving, we call back into the demuxer to read the cues or confirm that we’ve seeked to the right place and can continue decoding. As an additional protection against the library freaking out, I make sure that the entire cues element has been buffered before attempting to read it.